It's always the source of surprise to us when people who've slogged hard for 4+ years in school and often many more in the workplace spend 30 minutes jotting down random factoids about themselves and calling the result a resume. A resume needs to address HR staff, the people interviewing you, and the hiring manager. The people interviewing you and the hiring manager need to know what you've done that makes you special, so you need to differentiate yourself. Have a clear statement of your objective; in particular, make sure that you tailor your resume for a given employer. to computationally challenging problems; communicating them in written and oral form; and working with teams to implement them. I would like to apply these abilities at Google." The most important points, ones that differentiate you from everyone else, should come first - people looking at your resume proceed in order, so you want to hit them with what makes you special early one. E.g., don't list your programming languages/coursework early on (since they are likely common to everyone). Do list significant class projects (this also helps with the keywords for HR. ), talks/papers you've given, even things like GRE scores if they are really exceptional. The resume should be of a high-quality: no spelling mistakes; no inconsistent spacings; correct grammar & punctuation. Use few fonts/font sizes. PDF is preferred, since there's less issues with rendering across platforms. If you can work at the company without requiring any special processing (e.g., if you have a Green Card, and are applying for a job in the US), make a note of that. Have friends review your resume - for this reason, it's better to get something written up quickly, which can then be refined based on feedback. There's nothing sacred about a resume being 1 page long - 2 pages is perfectly appropriate (more than 2 pages is probably not a good idea though). As a rule, we prefer not to see a list of hobbies/extracurricular activities (e.g., "reading books", "watching TV", "Organizing Tea Party Activities") unless they are really different and not controversial. There's a wonderful guide to resume writing, and, more generally interviewing titled "Paul and Dominic's Guide to Getting a Quant Job"- Google should be able to lead you to it. 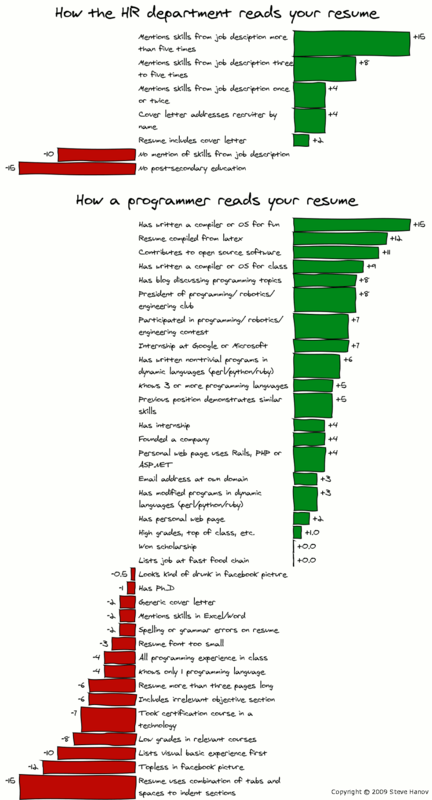 Here's a funny graphic on resumes by Steve Hanov.